Synopsis: For a thousand years, powerful earth vampire Carwyn ap Bryn has served others. God. His family. His friends. But tragedy and loss disrupt his peaceful existence, causing him to question everything he has committed his eternity to. Review: I love the Elemental Mystery series and I highly recommend you to read each novel because they’re all really great. But with the end of the Beatrice and Gio’s adventures, I was very pleased to see that the author did not stop there, and that a spin-off series would emerge. And that’s not all, because what more could we ask for than to have Carwyn featured this time? This is a mysterious character and yet he is always there for our two heroes throughout the novels. I wondered the moment we would be at the beginning of this novel, but in fact it coincides with some periods we have already read and so it was interesting to see what happened next too. But as the story goes much further, I was pleasantly surprised to see appearing Gio and B. at certain times of the history for my greatest pleasure. They are however a detail in a much larger plot. Indeed, here we follow the life of Carwyn and Brigid, a girl saved by the vampire when she was a little girl. Under the care of Deirdre and her husband, the girl blossoms while digging into some vices such as drugs. Carwyn did however hear none of it and is determined to save her. But he did not expect to fall in love with her ​​as she grew up and evolved into a whole new life. Fate will then link them with the death of Ioan and with the appearance this new drug in the market by Lorenzo, and causing extensive damage for both vampires and humans. I loved to follow the two main characters. Brigid has suffered a lot throughout her life, and it is difficult to get on now. The drug was particularly something revealing for her and it was very difficult for her to understand that she really had a problem. Yet she will succeed to get by and even to build a good life as a member of a security team for a very powerful vampire. I appreciated her bravery and determination to do what was best. Yet she is also very fragile and naive when it goes to her friends. In terms of Carwyn, I admit that I was amazed at how he fell in love with this girl and yet he does not know how to act. And despite the advice of everyone, it will take a long time for him before deciding what to do. He is willing to do anything for the others, and thinks very little to his own happiness. But he will soon have to deal with his feelings too, and especially convince Brigid that she could also fall for him. The plot of the story was also exciting! We discover the following events of the books I had the opportunity to read and therefore more about the elixir. I did not expect to find such a culprit at the end of the story but it was really well found. I was only sad about the story of Brigid’s friend, Em, which ultimately didn’t manage to get out of the drug or the life she led. A very good book and I’m sure that like me you will be very happy to find out more about Carwyn our dear priest. A spin-off to discover and I’m curious to read the next one now! 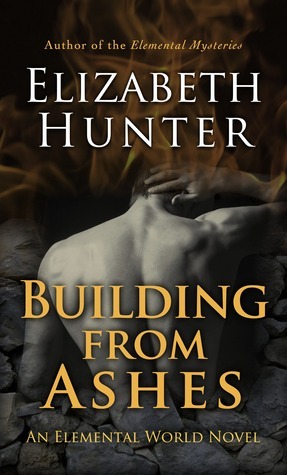 This entry was posted in Elemental World, Elizabeth Hunter, Mystery, Romance Paranormale. Bookmark the permalink. the first one in the principal series is free, you really need to read it! This cover is kind of cool! I like the sounds of it I haven’t seen it around before. It sounds like it has great characters and I love it when the cuprit takes you by surprise and it’s so rare lately I find. Great review! This is the first time I’ve seen this although I think I have one of her books that I got for free from Amazon. From your review I think it’s save to surmise that her writing voice is really good. This sounds like a darker vampire book, and I LIKE that so much! I mean, I like a lot of vampires, but I feel like it’s been awhile since I’ve read a really dark one, so I will have to give this a try. Thanks for the review, Melliane! Wow glad I am not the only one surprised by this author / book. I don’t think I have seen reviews of her books before. Glad you enjoyed it!